Different approach to loose articles for Yukon Striker. Crazy they even need to do this. With the cost of Steel today I just wonder if they would try and go for big and get close to Steel Dragons length. Im not sure. I hope they are able to keep some tree and not just chop them all down like they did with Diamondback. I believe it was rumored Paramount or CBS wanted to move it under a ride rotation program. 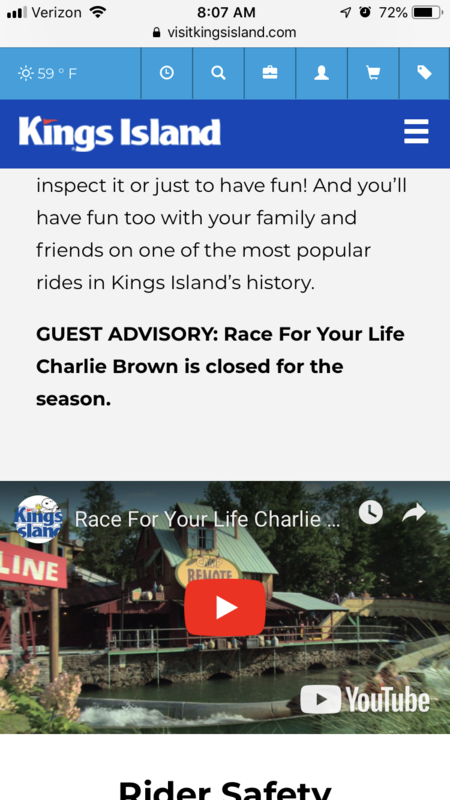 We are very lucky Flight of Fear is still at Kings Island. Is the removal of the Reds grill how the Reds expanded their hall of fame museum? It would be nice if the monster could Lower all its arms at once to help with loading and unloading. I didn’t Watch the video but do you think they were really married or was it just a marketing stunt? Maybe they could retheme Flight of Fear to You are shrunken down to a pint size and stuck in a skyline Chili 4-ways. Can you escape before you are eaten? In case anyone was wondering where this is coming from. I always fit but I have trouble on The Beast because the bars turn me inward for some reason. Don’t carry a lot of extra weight but I workout almost daily and have rather large thighs. I like the idea as I rather not get hit in the face with a flying phone. Did anyone notice how much more friendly all the workers seemed to be this year? With Kings Island being my home park it was really nice to feel like a stepped into a magical place with the new IE renno. Amazing!!!! Maybe it’s generally too cold or windy during those times and it’s easier just not to staff the ride? I have a lot of bills so I would rather just wait until I get back in my town to buy alcohol. For one $10 beer, I could buy a six pack for less than that. I'd rather just enjoy a nice refreshing Coca-Cola beverage instead. Don't get me wrong, I love that they fixed up Festhause, but don't expect me to buy a beer in the park. Yeah I agree but they need to keep the price high to help prevent over drinking but also sometimes a draft beer taste so much better. If you guys really want to see what Rozzi's can do, get yourself to Riverfest along the Ohio River on Labor Day Sunday. Its like the Kings Island fireworks on steroids. 6 full barges of TNT all synced to music with an all out finale. Its pretty great stuff, if you're willing to wade through the crowd of course. This is why you have a boat and swim in the river all day! Hardly any crowds and you get to stay cool. Such a great time. I like that they are bringing it back but it’s going to be hard to beat the original landscaping and feel of the ride it had. They pretty much could have put that BLSC anywhere in the park and someone chose that beatiful plot of land and basically turned it into a junk yard. We are going on preview night as family and just my wife and I will be there at some point Saturday. I don’t usually drink at the park but some times a nice cold summer shandy hits the spot on a hot day. I go to the park around 30-40 times a year and I never had an issue with any drunks. However we aren’t usually at the park late or during the haunt so maybe that is the difference. The little things like this will make this year so awesome!